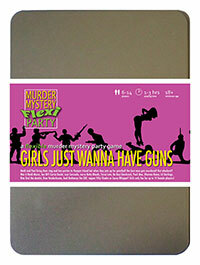 You've been invited to play the role of Consuelo Danza in Girls Just Wanna Have Guns. Heidi and Paul are throwing their pre-wedding parties at luxury spa and adventure resort, Pamper Island. But after one too many drinks, the bride and her entourage are invited to 'hunt the stag' with paintball guns - and best man Steve Wingman meets a grisly end! Can you find out who murdered him? Grab your guns and get ready for a facial at the luxury spa and adventure resort of Pamper Island! Your faith forbids you from wearing anything other than your nun’s habit and veil, but nothing in the guidelines mentioned how long the habit had to be. People need to see your legs when you’re dancing after all! I am Consuelo Danza, a nun that teaches dance. Preaching no longer works, so now we touch people with dance and not bread wafers like in the old days. I won’t try to convert anybody here, although I’m just one stamp away from golden rosary beads. Father Willbeedone has ordered me to observe the betrothed whilst partying to make sure they’re fit for matrimony in the eyes of the church. After today, I’ll need a few more vodkas before reporting back.